This happened a few days, but I am just able to sit down and write about. Due to senior Nick Haugen reportedly not returning to the team next season, North Dakota had a third scholarship available. 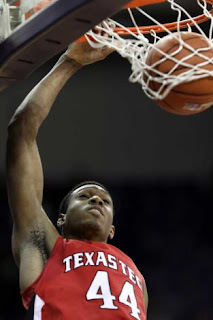 It was used to sign Texas Tech transfer forward Jaron Nash, a 6'8'' F who will have two years of eligibility remaining. Nash is transferring to be closer to his father, who has multiple sclerosis, according to the Grand Forks Herald. Because of this, he is appealing to the NCAA to be eligible to play this season for North Dakota. Nash played in 27 games for the Red Raiders last year, averaging about eight minutes per game. He averaged 2.5 points and 1.5 rebounds per game. He shot 52.8% from inside the arc, but a dreadful 12/43 (27.9% from the free throw line). He had pretty average rebounding rates, and turned the ball over a lot more times than he got assists. All that said, it is clear that if he is able to play this year, he will compete for a starting spot right away. There are four guys likely etched into the starting lineup - Jamal Webb, Aaron Anderson, Troy Huff, and Brandon Brekke - but the other spot is clearly up for grabs. The most likely candidate to step in was probably JUCO big man Alonzo Traylor, but he would have stiff competition from Nash. Going into the offseason, frontcourt depth was a huge issue for UND. After the spring signing period, it is clear that North Dakota has done a lot to clear up their biggest weakness. Is it pretty much a guarantee that he will be able to be eligible next year or is there a good chance that he could be sitting out? That said, from what I hear, most are assuming it is pretty much a sure thing that he will be eligible next year. Any word on Nash's eligibility?